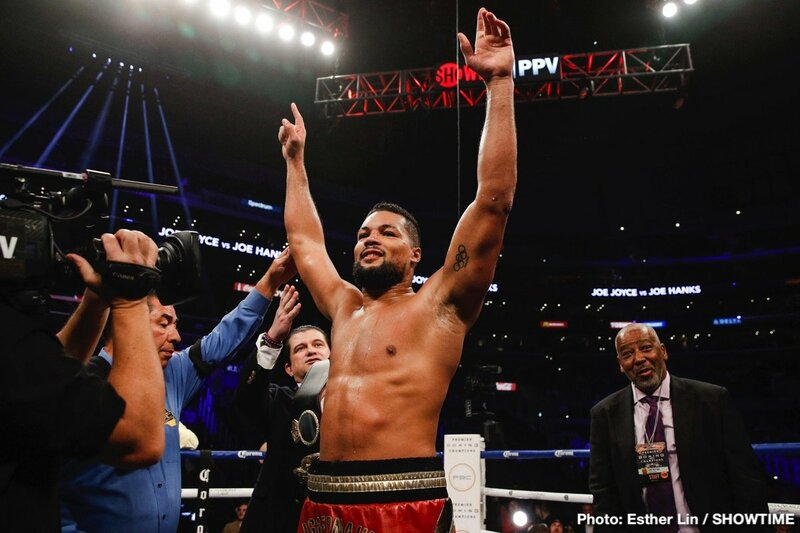 In an impressive performance against a fighter some felt would give him some problems, unbeaten British heavyweight Joe Joyce crushed Joe Hanks in the very first round on last night’s Wilder-Fury card in Los Angeles. Joyce, 33, lived up to his “Juggernaut” nickname as he blasted through Hanks. The fight was all over after just 2:25 of the first-round, courtesy of Joyce left hook to the head. Joyce is now 7-0(7). Hanks falls to 23-3(15). That he does. Hanks, once a real prospect in the heavyweight division, can attest to that. Joyce is a big man at 262 pounds and he has been moved pretty fast due to his age. 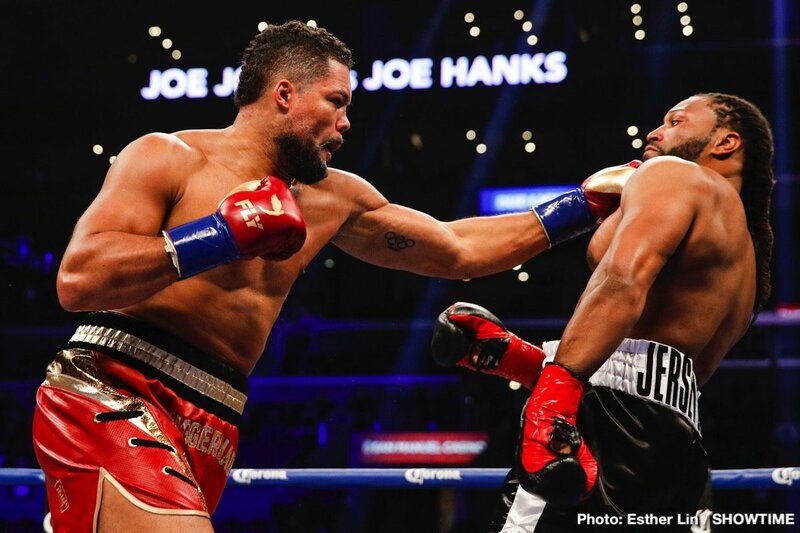 There is talk that Joyce could face Luis Ortiz soon, if not next (the Cuban southpaw gave a steady hammering to Travis Kauffman on last night’s big card, finally stopping him in the final round of a wholly one-sided affair). But would this be rushing things too much? Joyce is fully expected to have a good 2019, that’s for sure. Obviously a win over Ortiz would be a great result, but maybe Joyce needs a ten-rounder under his belt before he tackles the likes of Ortiz. A pro since just last October, Joyce of London has faced good fighters, all of whom had winning records at the time, and along with Daniel Dubois, he is the most exciting British heavyweight hope out there. 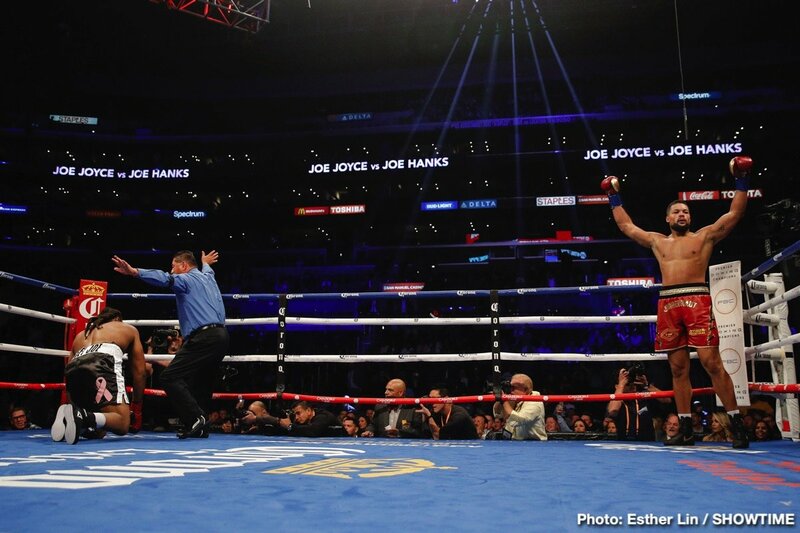 Hanks was expected by some to take Joyce a few rounds, maybe even test his chin. Instead it was another quick win that, although impressive, never really told us anything about Joyce we didn’t already know. Expect to see him back in January or February. Next boxing news: Deontay Wilder And Tyson Fury Give Us A Great One – And A Draw!